This book provides clear instructions to researchers on how to apply Structural Equation Models (SEMs) for analyzing the inter relationships between observed and latent variables. 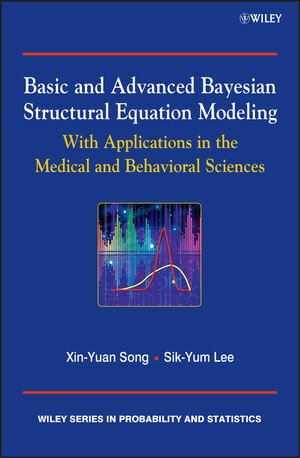 Basic and Advanced Bayesian Structural Equation Modeling introduces basic and advanced SEMs for analyzing various kinds of complex data, such as ordered and unordered categorical data, multilevel data, mixture data, longitudinal data, highly non-normal data, as well as some of their combinations. In addition, Bayesian semiparametric SEMs to capture the true distribution of explanatory latent variables are introduced, whilst SEM with a nonparametric structural equation to assess unspecified functional relationships among latent variables are also explored. Statistical methodologies are developed using the Bayesian approach giving reliable results for small samples and allowing the use of prior information leading to better statistical results. Estimates of the parameters and model comparison statistics are obtained via powerful Markov Chain Monte Carlo methods in statistical computing. Introduces the Bayesian approach to SEMs, including discussion on the selection of prior distributions, and data augmentation. Demonstrates how to utilize the recent powerful tools in statistical computing including, but not limited to, the Gibbs sampler, the Metropolis-Hasting algorithm, and path sampling for producing various statistical results such as Bayesian estimates and Bayesian model comparison statistics in the analysis of basic and advanced SEMs. Discusses the Bayes factor, Deviance Information Criterion (DIC), and $L_\nu$-measure for Bayesian model comparison. Introduces a number of important generalizations of SEMs, including multilevel and mixture SEMs, latent curve models and longitudinal SEMs, semiparametric SEMs and those with various types of discrete data, and nonparametric structural equations. Illustrates how to use the freely available software WinBUGS to produce the results. Provides numerous real examples for illustrating the theoretical concepts and computational procedures that are presented throughout the book. Researchers and advanced level students in statistics, biostatistics, public health, business, education, psychology and social science will benefit from this book. Sik-Yum Lee and Xin-Yuan Song, Statistics Department, The Chinese University of Hong Kong.